April 25, 2012, 4:32 p.m. 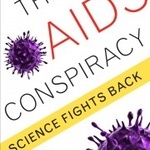 Professor Nicoli Nattrass of the Centre for Social Science at the University of Cape Town has published a new book called The AIDS conspiracy: Science fights back. In this article for Quackdown, she explores some of the themes in her book: how AIDS denialism and quackery are symbiotic. She also explains how AIDS denialism is facilitated by an organised movement that brings together people who share a conspiratorial belief that HIV science has been corrupted by the pharmaceutical industry.